Hi!. My name is Maria, 48 yrs of age, single mom living in the UK but I am originally from the Philippines. I never liked gardening in the past because I thought I didn't have 'green fingers'. However, I like houseplants and managed to grow them for years. When my marriage broke down, I didn't bother to tend the back garden for 6 years, the grass became untamed and brambles grew. Besides, I also suffered from a bad back which made it difficult for me to bend. I have paid people to cut the brambles and the grass as a result. But the problem was the grass and brambles kept growing back. It was so discouraging to look at and quite embarrasing too as my neighbours back garden were beautifully maintained. But this year, 2009, by the grace of God, I was motivated to cut the brambles by myself and saved myself money too. A christian lady friend of mine, Pauline, visited me one day and saw me struggling to cut down the thorny brambles with my old secateurs. Then one day she called me to say that she had found people from her church who would come one saturday to help me out. 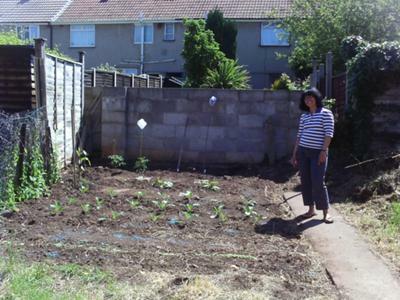 On the second saturday of May 2009, Pauline, her husband Mike and 2 of her church friends came with their gardening tools and helped me dig-out my back garden. One cut the grass and overgrown shrubs, others dug out the brambles and other weeds. The operation took about 3hrs. Then Pauline and I decided to leave the rest to go and buy some seeds and seedling plants. We went to the local nursery in Puckechurch and I bought 2 cucumber plants, 2 courgettes and cabbages to plant. The cucumber cost me £1.50 each which was expensive. The courgettes cost 75p pence each. The cabbages cost £4.00 for a box which was plenty. Then we went to Lidle supermarket and found that they were selling aubergine plants so I bought 2 for £1.29 each. They also sold iceberg lettuce seeds for 40p pence a packet. When we came back a 12ft by 12ft (roughly) patch was already prepared as my vegetable garden. I decided to plant the aubergines by the corner of the back garden together with the cucumber and tomato plants (moneymaker), which my next door neighbour gave me. Then I planted the courgettes behind the tomatoes. I also removed the red pepper plant I already had from its pot to the newly prepared soil and planted it next to the courgettes. Then I planted 18 cabbages in 3 rows. I then sowed the seeds of lettuce. Pauline's friend brought some carrot seeds which she gave me to plant too. I have added the squash plants which I grew from seeds after 2 weeks. I placed some slug pellets around the plants and poured tomato and vegetable feed on my plants the week after I planted them, except the seeds of course. I thought that my plants will be safe from insects but forgot my neighbours cats who used to defecate in my backyard. I was surprised to see their litter in one of the peppers! My goddaughter's dad suggested I place orange peel round the edges to deter the cats from coming to my vegetable patch. It seemed to work because I never saw anymore litter. Its been nearly a month now since my vegetable garden was prepared. I can now see the tomatoes flowering and the leaves of lettuces coming out from the soil. It is a pleasure to watch. Sadly, only 1 of the cucumbers survived and 1 of the cabbages wilted. Another friend told me that it was due to lack of water. Now I have been watering it much more and have been cultivating the soil around the vegetables. Although I have to be careful and vigilant in caring for my vegetable garden, I am getting so much pleasure from it that I don't feel any back pain. Glory be to God! I also came from the Philippines and its so nice to know that gardening became therapeutic to you. I also want to fix our backyard someday and grow my own vegetable garden. I wish you the best in your gardening! It's been 4 months now since I started my vegetable garden. There has been good news and bad news. Good news is I harvested loads of crops, specially my courgettes, lettuces, swiss chard, spinach, squash and cucumber. I gave some to church friends. I am also waiting for some more crops I planted like beetroot, dwarf french beans, potatoes, beans, carrots and mooli. Well, vegetables are like people in some ways, win some lose some. I too planted my first garden this year. With no ones help, I have managed to grow Zucchini until it is coming out of my ears and it has taken over my small area. I have planted one water melon plant, 3 zucchini, one yellow squash, red bell peppers and a tomato. The others can't grow due to the squash covering them all and keeping the sun away from them. Any ideas. I need all the help I can get! I must commend you on your excellent effort in your garden experience! I am from WI. and have been gardening for 4 yrs. now and absolutely love it!! I experiment every year and grow a different vegetable and find it very interesting as you never know how well it will or wont do, depending on the location you put it in the garden. I have grown peas, carrots, onions, tomatoes, peppers, lettuce, herbs and radishes in my garden in back of my place. I also have a garden much bigger at my brothers place, he has a lot of space in his yard, so we started a garden there 4 years ago. My dad and I used to enjoy planting a garden together every year. He just passed away in March of this year so this is the first year without him helping, but feel he is with me when I plant it. This year we tried many new veggies - zuccini, brussels sprouts, cabbage, kohlrabi, beets, spinach, and of course the tomatoes, peppers and herbs too, can't get enough of them!! So keep up the good work and every year it gets better and better the more you get into it!! U go girl... Ideal I plant dill by my cucumbers and basil by my tomatoes. Fresh tomato slice with a little olive oil and fresh basil leaf. mmmm good. Dill is good if you make pickles. This year in Arkansas been bad so far for our garden. But we have good years and then not so good. We make our own little compost pile also, always helps the soil. Cool story!!! and I got very encouraged by that!! I know how much you appreciate church friends and your garden. I have been unable to raise a garden until this year (09). I live in Texas and we have to water often too. It's great you can have a garden, and it's a lot of work. I live in Texas USA, and we have a lot of gardening here. I grow a lot of vegetables - most all kinds that will grow here, and grow flowers. We have to water a lot because its so hot in the summer. I have onions, radishes, squash, yellow and zukini (courgettes). Corn and tomatoes, which are blooming now. Can you exchange seeds? or recieve them?? What a story of inspiration - your garden looks great. Remember to attract the pollinators, they're natures best friend. Hi Maria, my name is Marion, when I read your story it sounded a lot like my own. Both my parents loved gardening, they grew everything you could possibly imagine. Never in a million years did I think that I too could or would grow my own. I started just 2yrs ago and have to say... I'm loving it, I grow (or I am attempting) to grow what I can, I'm limited like you but at the moment every thing I've planted has taken and is growing great. I just wanted to tell you... keep it up, it's so rewarding when you see all your hard work pay off, I love my garden now. I Love People Coming Together! What an inspirational and uplifting story about your garden. Bless your friends and their desire to create this wonderful space for you and with you. Those kind of friends are not easy to come by. This is why I am always drawn to my church family. We should all learn from this and have at least a small garden or plant some flowers, in spite of our busy schedule. Great work Mom Maria and it is truly inspirational. God Bless and give you more strength to do such good deeds. Your garden will be a constant learning experience, so don't be deterred by setbacks. Next year start your cucumbers from seed... they will do better. Just don't plant them beside the squash or other melons. If they can be planted next to a wall, then help them climb it. During the winter, see if someone in the church has some old boards or concrete blocks that you can use to make a small raised bed in the corner. You will be amazed at what a difference it makes. Plants grow better, weeds are easier to control and it is a hundred per cent easier on that bad back. It seems like that last six inches of bending is the worst. I use a raised bed for the lettuce, so I can get it going early and keep it weed-free. Late fall and early spring I make a little plastic tent over the raised bed to keep the lettuce safe from frost. Don't forget to say thanks to God every time you go out to the garden. It is God's doing, not ours. when I saw the picture, I thought, "you're here in the Phil!" I never knew that your backyard would look like ours here, but it's still prettier... anyway, at least now, you're into gardening, so that's good news! It's a very worthwhile thing to do, right? Keep it up and go go go organic! Hi Maria, that was an awesome change in you. Never thought you would be liking gardening, growing vegetable plants and stuff after all these years. God bless you for acquiring such a skill. Go Green girl! It's good and healthy for the body and most of all good for the environment. Your blog is so informative and worth visiting. What Aubergine and Courgette Are! Aubergines are eggplants and courgettes are zucchini. What's an aubergine and a courgette? It takes time for the garden to come together, but it is a lot of fun and very rewarding. That garden looks great and will just keep getting better. Thanks for sharing your inspirational story Maria. I've no doubt you had to push hard to get yourself motivated to get to grips with your `jungle` and I salute you. I hope you continue to get much pleasure from growing vegetables for many years to come.